OS 6" map, Orkney, 2nd ed.,(1903). 'Chambered Cairn, Quanterness. 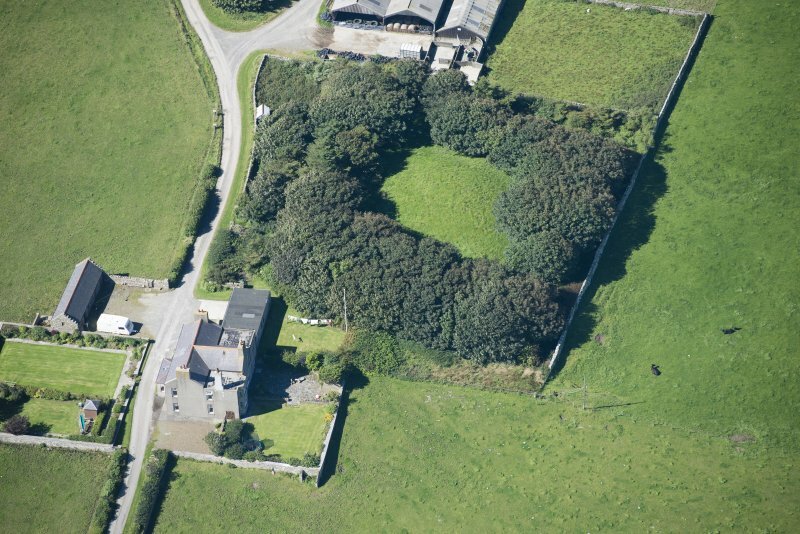 ....... a conspicuous green mound marks the site of a chambered structure which was explored at some date shortly before 1805. (G Barry 1805). Neither the entrance to the passage nor any chambering can now be identified, except for slight mutilation to the top of the mound, due to the digging of two shallow pits and the erection of a flag pole, it is well preserved. Visited by OS (GHP) 5 April 1964. Between 1972 and 1974 the chambered cairn of Quanterness was excavated by Professor Colin Renfrew, with the aim of dermining the nature of the mound, to obtain organic remains for radiocarbon dating, and evidence for its wider environmental and cultural setting. Early Iron Age roundhouse in Firth, discovered within the debris of the cairn of the Neolithic tomb of the same name [1, 180-98]. The work by Renfrew on the chambered tomb was carried out between 1972 and 1974 and the discovery of the roundhouse was not anticipated. It was the first in Orkney to be assigned to the late Bronze Age or early Iron Age periods and the discovery shed an entirely new light on the broch period in those islands, hitherto hardly understood and relying entirely on the evidence from old excavations (no new broch has been explored by the spring of 2002). The early date of the foundation of the house, probably in the 6th or 7th centuries BC (the excavator suggests c. 700 BC), is supported both by C14 dates and by the small amount of associated pottery. The house was built by removing part of the cairn material around its entrance passage and building the circular wall partly on the old ground surface of clay and partly on the base of the cairn material. The wall was originally about 80 cm thick, widening to 1.0 m at the short entrance in the SE; it enclosed an area some 7.0 m in diameter. The NW part of the wall overrode the entrance passage of the Neolithic tomb but it was not clear whether this was exposed during Iron Age times, as it was at Howe; at a late date it seems to have been entered. The remains of a hearth were found on the NW side. There were alterations to the interior subsequently, involving the construction of various partition walls and, later, the thickening of the roundhouse wall itself. Finds: most of the pottery and other finds were recovered in the entrance passage. The pottery includes a one piece with a sharply angled shoulder, analogous to the early Iron Age material from Jarlshof and Clickhimin [1, fig. 53]. There were also some sandstone cobbles, presumably hammerstones, and one ivory mount. A number of animal bones were recovered and a report on them is available [1, 192-04].